It is with the deepest sympathies we announce the tragic loss of one of the greatest smartphones, the Apple iPhone. Chief executive Tim Cook broke the news to Apple loyalists with the unveiling of larger screen variants in what will be remembered as a pivotal moment in Apple's history. The iPhone we know and love was introduced in 2007. The smartphone donned a 3.5-inch display up until 2012, when it hit puberty and shot in size to 4-inches. The year the iPhone came into its own was 2013. The iPhone 5S represented a near perfect product after years of refinement. Holding any other smartphone in the hand, with their gargantuan screens and heavy weight, felt antithetical to what constituted a smartphone. Samsung may have blood on its hands by pioneering the ‘phablet’ category with its Galaxy Note. By designation of the moniker, the 5.5-inch device was neither smartphone nor tablet, but rather a frankensteinian compromise between the two. Now it appears Apple, frantic and wayward following the loss of co-founder Steve Jobs, has given into market pressure with the unveiling of not one, but two large-screen iPhones. Front on, the iPhone 6 and iPhone 6 Plus look the part, only with its design language stretched. The diminutive size of Apple iPhones was critical to its identity. Screen off, what sets the new iPhones apart from any other Samsung or HTC? 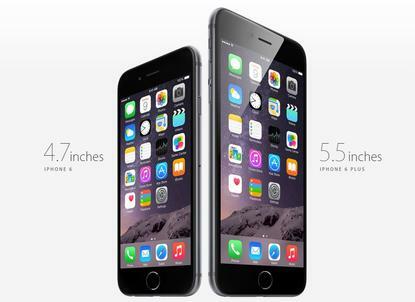 The advent of the iPhone 6 and 6 Plus represents Apple no longer showing customers what they want. Rather, it is with sadness and trepidation we consider the company is now playing catch up to its rivals. But a single feature in the iPhone 6 is new to the market. The company may have announced the Apple Watch, a square-faced electronic competent in software and specs, but I’ve yet to come past a single person who believes it is good looking. And we are in an age where the appearance of a watch matters as much as its ability to tell the time. Wearables represent a big pile of money companies can claim following a saturated smartphone market. Apple needs to have a foot in the door. We’re just not sure the Apple Watch is its best foot to put forward. The past is brighter. The luminance of the iPad continues to burn, and even though the 5S’ moment in the spotlight is no longer, it will continue to shine long after. It will rest high on a mantle alongside other greats that include Nokia’s 5110 and, perhaps, Motorola’s Moto 360.